If you still haven’t bought your ticket to Intersections, the only national conference discussing Complete Streets implementation, creative placemaking, and equity, then you’re in luck! We have a special offer just in time for Valentine’s Day to celebrate your love for arts & culture. Curious as to how transportation, public health, civil engineering, art, local governance, cultural identity, and Complete Streets connect? 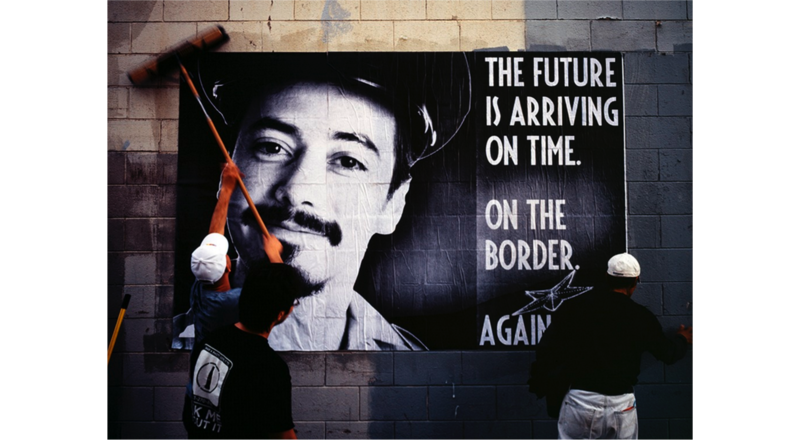 This week we’re thrilled to share our expert line up of keynote and plenary speakers for Intersections: Creating Culturally Complete Streets. They will join over 60 other speakers in Nashville, April 3 – 4, to explore these themes. Today’s the last day to use our “New Year New Intersections” promo to get a $55 discount for the Intersections conference, hosted by Smart Growth America and the National Complete Streets Coalition in partnership with the Urban Land Institute. 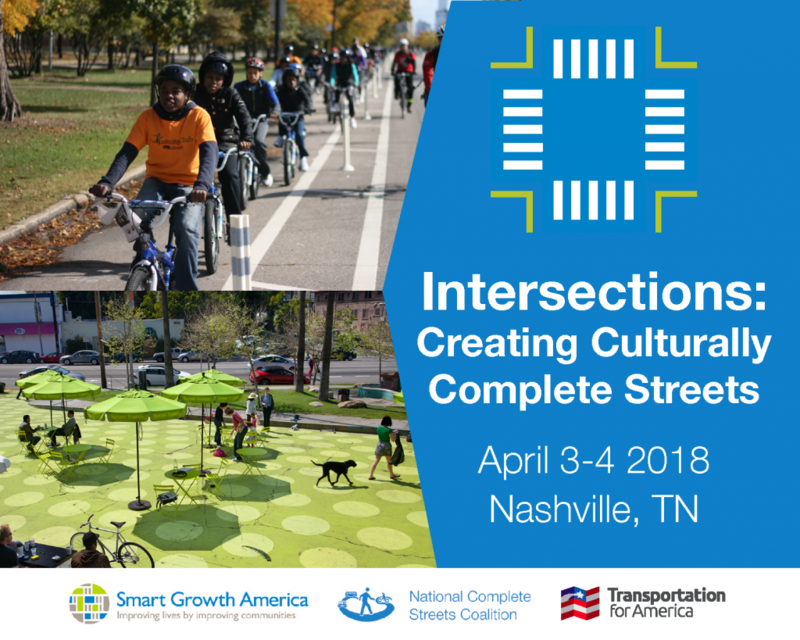 Join the movement this April as we welcome speakers from across the country to Nashville to discuss the power of cross-collaboration, genuine community engagement, and civic design to create culturally complete streets. Smart Growth America’s National Complete Streets Coalition, in partnership with the Urban Land Institute, invite you to our second national conference: Intersections: Creating Culturally Complete Streets. The conference will bring together planners, artists, engineers, public health advocates, and many others to collaborate and find practical ways to integrate arts and culture to create streets that are not only safe for everyone, but also better reflect the unique character of their communities. The National Complete Streets Coalition is proud to partner with Transportation for America’s Arts & Culture team for our second national Complete Streets conference. Save the date and take part in the movement on April 3-4, 2018 at the Nashville Music City Center. A new trend in local economic development is emerging. Talented workers—and the companies who want to employ them—are increasingly moving to walkable neighborhoods served by transit, with a vibrant mix of restaurants, cafes, shops, cultural attractions, and affordable housing options. Join us for the launch of "Amazing Place"
For decades, if a community wanted to increase jobs, the go-to approach was to offer companies tax breaks and subsidies to relocate there. This approach has lots of downsides. But perhaps the biggest problem for economic development officials now is that too often, this strategy simply doesn’t work. Companies today are less interested in tax breaks and more interested in vibrant neighborhoods with affordable housing options, restaurants, nightlife, and other amenities in walking distance, and a range of transportation options for their employees. If tax breaks were the old way to do economic development, creating great places is the new way. On Tuesday, June 28, we’ll release Amazing Place, which details how six cities are using a place-based approach to economic development. Rick Bernhardt, right, discusses different development strategies with Nashville residents. Photo by NashvilleNext via Twitter. Nashville, TN, is a creative city with a rich history in the arts that has recently seen new growth in both its population and economy. Rick Bernhardt, the Executive Director of the Metropolitan Nashville-Davidson County Planning Department and member of Smart Growth America’s Local Leaders Council, is working to make sure the city’s development supports that growth. This month, we’re looking back at some of Smart Growth America’s brightest moments and greatest accomplishments from 2013. First on the list? We’re celebrating the over 550 Complete Streets policies that have been enacted in the United States. Complete Streets policies help create streets that are safe and convenient for everyone who uses them, and today over 550 communities across the country have enacted such policies. That’s a milestone worth celebrating. In August the National Complete Streets Coalition, a program of Smart Growth America, brought together transportation officials and national smart growth experts in Washington, DC, to celebrate the accomplishment. Nashville, TN Mayor Karl Dean signed a Complete Streets Executive Order in 2010, joined by former Councilmember Erik Cole and former city staffers Toks Omishakin and Chris Bowles. Photo by Gary Layda, City of Nashville. 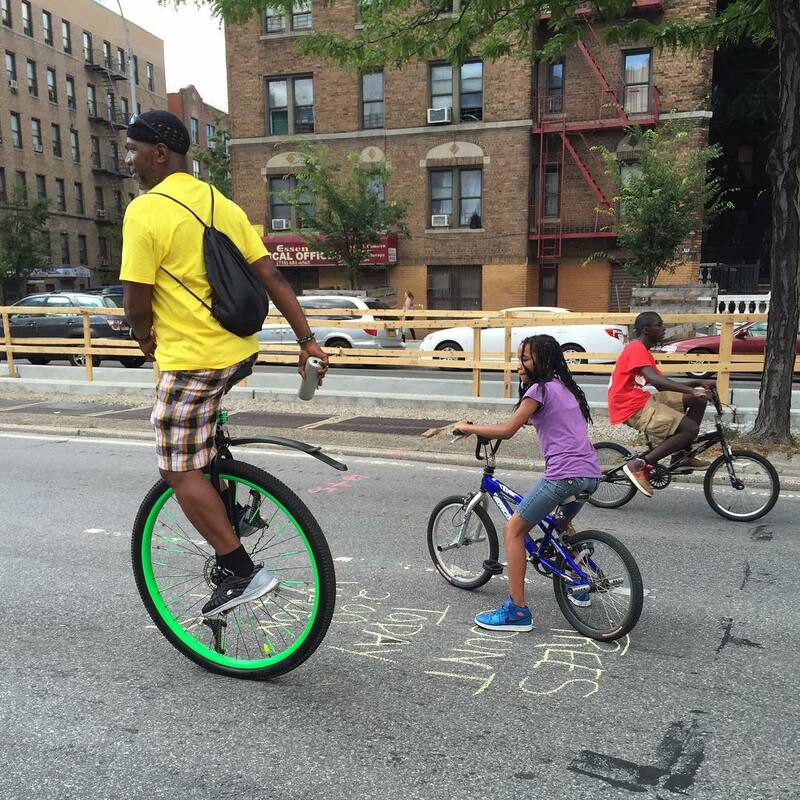 This post is the second in a twice-monthly series of excerpts from Completing Our Streets: The Transition to Safe and Inclusive Transportation Networks, the forthcoming book from Island Press by Barbara McCann, founder of the National Complete Streets Coalition. The book discusses the keys to the movement’s success, and how places and practitioners in the United States are tackling the challenges of putting a new transportation paradigm into daily practice. Look for the book out on October 14, 2013. All National Complete Streets Coalition Platinum Partners and those who upgrade to the next Partnership level will receive a signed copy of Completing Our Streets. Become a Coalition Partner today! After we started the National Complete Streets Coalition, I spent a lot of time developing a series of focused fact sheets that brought together the best and most specific answers we could find on every topic related to Complete Streets. The website was soon overflowing with reports and resources on every aspect of the benefits of Complete Streets. But somehow they were never enough. They never slaked the hunger from people around the country for very specific information about how to answer a challenging question with an indisputable fact. Over time, I realized I was learning how to overcome barriers not by regurgitating facts but by hearing stories about how others had made change happen.